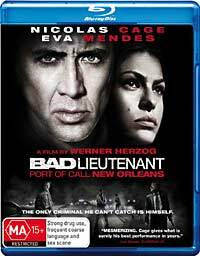 I’ve just been looked at a forthcoming Blu-ray title from Roadshow Entertainment: The Bad Lieutenant: Port of Call – New Orleans, directed by Werner Herzog and starring Nicolas Cage and Eva Mendes. This title comes from Roadshow Entertainment and has two unusual features. First, like a lot of Roadshow’s titles it is Region Coded B (it often has geographically limited distribution rights, and I suppose it is contractually required to do what it can to keep within those borders). Sometimes region coding is implemented in a way obvious to software, so AnyDVD HD can immediately report on the region code, but most often it is more subtely applied, in which case AnyDVD HD reports ‘Note: automatic detection of region code not possible with this disc’, as it does with this disc. That isn’t unusual. I work out the region code restrictions of a disc simply by playing it in PowerDVD with the region code explicitly set in AnyDVD HD to first Region C, then Region A (I assume Australian discs will work in Region B!) Every Region coded disc for which I’ve done this pipes up straight away to complain that the player’s region code is incorrect. But not this one. It plays the Roadshow video logo, then it displays the copyright information panel, and then brings up the main menu. Only if you try to start the movie proper, or one of the special extras, does it throw up its complaint and refuse to let you go any further. The other unusual aspect? The main audio is Dolby TrueHD 5.1. The embedded legacy audio (which I’ve previously, and incorrectly called ‘core’) is Dolby Digital, as usual. But not Dolby Digital 5.1. It is Dolby Digital 2.0, yet is still gets a full 640kbps encode, so clearly it wasn’t used to save space. This entry was posted in Blu-ray, Disc details, Region Coding. Bookmark the permalink. Are trailers playable in a wrong region? If so, this makes nice demo-disc. If the region protection was automatically removed in a year after BD release, this may make sense: watch preview now and the full movie later, like with teatrical releases. Clever idea, but no trailers on the disc. Time-related protection would also be a clever idea, except that it would be too unreliable. It would have to be BD-Live enabled, and on a BD-Live player that’s plugged into a working network. Otherwise the disc wouldn’t know what the date is. An even cleverer idea is to get a BD player that plays all regions. A pox on territorial protections, especially as day and date releasing becomes more common – unless of course the studios are happy to encourage piracy by delaying releases in certain territories, thereby forcing their customers to seek their product by some other means. I’m off to the States shortly and expect to load up on cheap BD discs, legally, and to be able to play them on my return, and where’s the harm in that? I don’t hold it against companies such as Roadshow, Icon, Madman and so on, since their distribution arrangements are often limited and I imagine their contracts demand it of them. Warner Bros, Universal, Paramount and now, it seems, Sony either don’t use it, hardly use it, or have given it up. 20th Century Fox uses it, though, for goodness knows what reason. My real annoyance with region coding has been the Criterion collection. So many classic films given awesome transfers and extras only to be Region “A” locked. I’m seriously considering importing an Oppo just so I can play Criterion BD’s. Or purchase it in Australia and you get Region A, B and C support. Local distributor is Merlin Audio. Or buy one from Oppo direct and also buy a multi region chip, like I just did. $1075 from Merlin vs $764 landed. The whole region coding thing is defunct and should be gotten rid of. I won’t even go into downloading torrented movies. Thanks for the advice guys. Given me something to think about. I’ll probably go the 80 though since my Pio LX508 has an internal scaler that is quite superb, so I don’t really see the need for the 83 and its impressive VRS. Hey Simon, that makes it a brilliant price. How did you find doing the multi-region upgrade. Kind of thing just about anyone could do, or do you need some level of technical skill?